60 years from the first radio set made by Radio Popular. In the Monitorul Oficial (Monitorul Oficial is the official gazette of Romania, in which all the promulgated bills, presidential decrees, governmental ordinances and other major legal acts are published.) nr. 252 1948, 29 october it is mentioned the fact that S.A.R. Philips- Bucuresti is renamed with Radio Popular Factory as a result of nationalization. From the installation, as radio manufacturer in Romania, Philips manufactured circa 60000 radio sets with imported parts. In the next year 1949, the firs annual plan has started and so the first radio set based on the Russian model Rekord 47. Nobody has had the courage to change the name so the first Radio Popular radio has the same name: Record and an internal code S 49 U.
I can not explain the “S” but 49 is stated for the year of introduction in production and “U” for “universal”. AC-DC set. The textile and the model around the dial glass are from Philips (see Philips 32U). It was produced around 20000, S 49 U sets and many more based on the similar Russian products. Special thanks to RM.org member Mrs. Lenuta Chirita from the Musee de la Science et de la Technique Bucharest. In Romania, the first pieces of information on television were published in two specialized magazines, Radio Român and Radiofonia, already in 1925. By then, television had not yet had an official name. Baird refers to it as televisor – and the Romanian versiosn oscillate between radio-viziune, radioteleviziune and televiziune. In 1925 the Accoustics and Optics Laboratory within the University of Bucharest carried out the experiment which consisted in the transmission at small distances of some drawings. George D. Cristescu,physicist, published the first work on television in Romania “On Television” (original title “Problema televiziunii”), Bucharest, 1928, where he proposed a new system of mechanical exploration. In 1928 he also carried out the first attempts within Romania of tele-transmission of images. In November 1937, the Romanian Athenaeum of Bucharest presented within a demonstrative conference the first Romanian achievement in the field of television: an image – broadcaster made within the laboratory of the Faculty of Sciences in Bucharest. The presentation raised the interest of more than 2000 persons and consequently the experiment had to be repeated. The first experimental television station ever built in Romania was prepared by a team coordinated by prof. Alexandru Spãtaru of the Central Laboratory of Telecommunication Research in Bucharest. On 23 August 1955, the experimental station started regularly broadcasting for the few tens of TV sets existing by then in Bucharest. By the end of the same year, the Television Centre of Bucharest started its activity and it was equipped with Russian devices. In 1964 there took place the first demonstrations of colour television using the SECAM system, but it was only in 1972 that the broadcast station of the Television Studio became operational. It was in 1964, within the Electronica enterprise, that the specialists of the factory created and produced the first TV: E43-110, which was then followed in 1966 by the TV sets Dacia, Miraj with Romanian electronic tubes. In 1970 there took place the inauguration of the Black-and-white Kinescopes Enterprise with German and American licenses. Between 1971-1978 hybrid TV sets were created (with transistors and electronic tubes) H1 and H2 and starting from 1977 black-and-white TV sets with integrated circuits were produced. In 1984, there were built the first portable TV sets with reduced consumption of energy. In 1983 the first Romanian colour TV set was produced, its name being Telecolor 3006. After 1989 the Romanian electronic industry could not cope with the concurrency and from producer it turned into a costumer. Electronica still produces (12/2006) electronic equipments and assembles TV sets produced by famous brands on the market. Feel free to add your own experiences with the Romanian Television between 1955 and 1989/1990 during the Communists era! Interesting article. Research, but not a question. In Romania, the first wireless telegraph equipment, imported from France in 1903, was installed on the sea ships: Regele Carol I, Principesa Maria, Împãratul Traian, Dacia, România and at the headquarters of the Romanian Navy Service in Constanþa. The station of S.M.R. acted throughout 600 km ensuring the communication with the ships on the sea . The land army was equipped in 1908 with mobile stations from Germany (three devices with sparks, type Telefunken) and in 1913 with stations of low power from England (produced by Marconi Company). The equipment was inappropriate so that when Romania entered World War I, the army did not own any device of high power, which could enable the communication at distances of more than 1000 km . Under these circumstances, eng. Emil Giurgea made available his own station built with components brought from abroad (1914), while prof. Nicolae Vasilescu-Karpen (1870-1964) created a wireless telegraph station in Park Bãneasa (1915). It was also in 1915 that prof. Nicolae Vasilescu-Karpen installed in Bucharest (Herãstrãu), a radiotelegraph station imported from France, of a power of 150 kW and the wave length of 11000 m, replaced five years later with a broadcasting station with electric arc . Radiophony in Romania undertook a difficult road not because of lack of interest to this field of activity, but mainly due to a lower rhythm of legislative activity. Scientists and scholars sustained in various publications and conferences the necessity of introducing radiophony in Romania too, taking into account that in many European states and in the U.S.A. there were permanent radio emissions already in 1919-1920. Their activity resulted in the foundation, in 1925, of the "Association of the Friends of Radiophony", under the coordination of prof. Dragomir Hurmuzescu (1865-1954). The association had as an objective to make radiophony popular by public auditions, conferences and training courses, which took place on Victor Emanuel Street in Bucharest . It was also prof. Dragomir Hurmuzescu who coordinated experimental broadcasts at the Polytechnical Institute of the University of Bucharest. 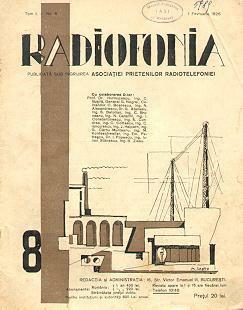 Magazines, specialized or addressing to the large public, such as Radiofonia ºi Radio-Român (Fig.1), also played an important role in the popularization of radiophony. The bimonthly magazine Radiofonia issued on 15 October 1925, within the auspices of the Association of the Friends of Radiophony, had an editing team which included professors and prestigious engineers such as: prof. Dragomir Hurmuzescu, eng. E. Petraºcu, eng. Mihai Konteschveller- inventor and author of specialized books, eng. I. Constantinescu-author of taught courses in telecommunications for student, among others. In 1928, the magazine is re-published as a promotional organism of the Radiotelephonic Broadcasting Society of Romania. 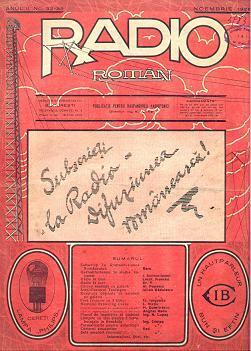 The weekly magazine Radio-Român, issued on 13 September 1925 under the coordination of eng. Nicolae Lupaº, was also successful among the amateurs of radio, due to the presence of numerous schemes of building radioreceivers, as well as thanks to the many pieces of practical advice. In April 1928, its activity stopped for financial reasons . These magazines carried out a sustained propaganda for the foundation of the National Broadcasting Society, so to assure the legal framework for the functioning of national radio stations. In the magazine Radio Român of 20 December 1925, engineer Nicolae Lupaº was optimistic in this regard: "Too long delays are really excluded as thousands of amateurs start having a word to say. Showing an enthusiasm, which is in line with the beauty of the cause, amateurs overtook the authorities of the field, with achievements, which most often exceed all expectations. Thus, before any official broadcast, in Romania, under the coordination of prof. D. Hurmuzescu, there exist and are in full development the Society and two magazines, each with few thousands readers". Yet, an article in the issue of 1 February 1926 of magazine Radio Welt of Vienna showed: the radiophonic movement did not record any improvement if compared to last year's. The State does not support at all this trend; on the contrary, it rather raises impediments to the development of radiophony. Radio sets are not made as all fitting schemes are to be forwarded for checking and approval to the general Direction P.T.T.". Indeed, due to "the Law for the Installation and Use of Radio-electric Stations" (September 1925), which regulated the right to audition and stipulated the foundation of the National Broadcasting Society, it was quite difficult to get authorizations for the reception stations, and this was possible only after filling in formal papers such as: certificate of correct behaviors, issued by the police or gendarmerie, attestation of citizenship and a request form where the subscriber committed himself to the respect of the extant laws . Before the foundation of the society, there were made frequent attempts to broadcast concertos of Romanian music, especially on festive occasions, without respecting any well established programme. Thus, the field station S.F.R. of Herãstrãu tried in December 1926, for about two weeks to transmit Romanian emissions which according to magazine Radio Român  were of poor quality due to the "awful noise of cars and whizzing of the parasite oscillations of lamps." "1. The State, acting by virtue of the king's right, dictates in the administration of the society, and the private sector, with an income of 20.000.000 lei in cash, has no power of decision. 2. The restrictive and irrational regime for issuing authorizations for installing reception stations". In spite of all difficulties encounteres, the Romanian Broadcasting Society is founded on 27 December 1927. Moreover, there started the construction of the radio station in Bãneasa. Devices ordered in England, at the company "Marconi Wirelles", were to be installed there. Before their delivery, a Marconi station of 400 W, borrowed from the producers, was temporarily mounted so to enable the inauguration of the first national radio station on 1 November 1928, at 5 o'clock p.m. With the occasion, prof. Dragomir Hurmuzescu pointed out the role of this means of communication: "Radiophony is not just enternainment. Radiophony has a wider social importance than theatre for the dissemination of culture and unification of souls, as it can address a whole world, entering the furthest huts of village people" . In October 1929 ended the installation of the station Radio Bucharest in Bãneasa, equipped with an antenna of 12 kW. The broadcast programmes were carried out in the studios of the society, at 60, General Berthelot Str (Fig. 2). The studio was directly connected to the emission station in Bãneasa through a cable long of 95.000m foreseen with 7 circuits: four for broadcasting and three for telephony. The emission station had sixteen electronic tubes, out of which six rectifiers of the type Kenotron "Marconi C.A.R.-2" water-cooled and of 75-80 kW consumption. The antenna was of the vertical type, with the wavelength of 96 m and the nominal power of 18 kW at a modulation of 80% . At the same time with the trial transmissions of the station of Bãneasa, there were also experimental transmissions on short waves using the old station of the Institute of Electrotechnics of Bucharest, on the wave length of 31-36 m mounted by eng. D. Petraºcu and a station on the wave length of 49 m, installed at the Polytechnical School by prof. Tudor Tãnãsescu. 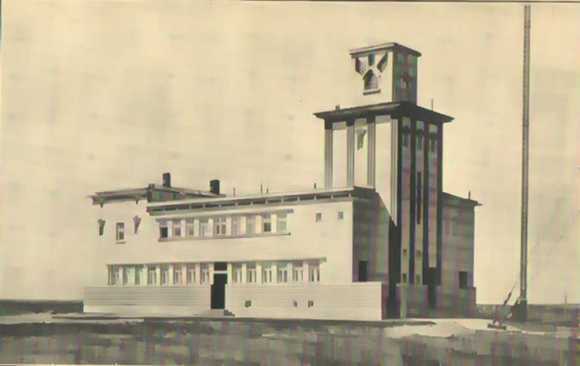 As "Radio Bucharest" covered only a limited territory around Bucharest, in 1935, the broadcasting station "Radio Romania" was arranged at Bod, near Braºov. It was transmitting on the wave length of was 1875 m, with a power of 150 kW. This radio station, in spite of all its imperfections, could be received throughout the whole territory of the country, with some exceptions. In 1941, the first territorial radio station in Romania, "Radio Moldova" was arranged at Iaºi. It was a broadcasting station made by the Italian company Magnet Marelli within the American license of R.C.A., with Italian electronic tubes air-cooled, which was an advantage as it provided safety while functioning. The station, fully automatic, had a power of 5kW and emitted on the wavelength of 550-160 kHz. In Bucharest, the reception of "Radio Moldova" was better than the one of "Radio Bucharest" in Iaºi, although this had a power of 12 kW and a 96m-antenna; though, it should be remembered that between 1929 and 1941 techniques had developed . Concerning the emission by frequency modulation, although it had already been experimented by the American Edwin Armstrong in 1933, it was introduced in Romania only in 1956. The experimental station was designed and made by a group of engineers of the Polytechnic Institute of Bucharest, and it daily broadcast programme I. In 1957, the second station started functioning; it had been prepared by a team of the radio station of Bucharest and it daily-emitted programme II. Before the law of radiophony was adopted in 1925, the trade of radioreceivers was sporadic, including mainly parts and sets introduced in the country by private persons and quite rarely, by some merchants. In autumn 1925, once the company Radionel and the enterprise Radio-Electrica were founded, exclusively dealing with radiophony, one can speak of radioreceiver commerce in Romania. In 1927, the society SAR Philips was inaugurated and started selling the products of Philips, Holland . In Romania, no local producers of radio sets existed before 1949. It was the year when the specialized factory "Radio Popular" was opened. Record (S49U) was the first radioreceiver made from Soviet machine parts and patent. Because of the fact that "Radio Popular" could not cope anymore with the market demand, the enterprise "Electromagnetica" started to produce in 1954 two types of radioreceivers with components parts from URSS and Hungary EM 541 and S520. The first Romanian modern radio was "Opereta" made in 1958 mostly from Romanian components parts . In 1960, its name was changed to "Electronica". "Electronica" will produce for the first time in Romania portable radioreceivers containing transistor set (Solistor, Sport) under French licence and later transistor set in a local conception (Turist, Primavara). It also produces radioreceivers with tubes with USW band. In 1974, the "Tehnoton" company was founded in Iaºi and it started producing a wide range of portable and fix radioreceiverss, destined especially to the internal market. I am very positivley impressed with your useful information about Radio and Radiophony in Romania. Thank you for your Paper. Excellent work. Excellent explanation. Congratulations to Your well elaborated interesting article. It provides an overview as well as detailed information about a widely unknown field. Wireless history is well documented for the countries where this technology was initially developed: as there were Germany, USA, UK, France, Italy, Russia. Those with "minor" contributions to basic introduction of wireless, are hard to find in the records of Radio history(besides the own national one). Your article is really filling a gap. Thank You!